From Our Readers: “Paul, I am writing because for the last few months I have been looking to replace my old George Forman Grill with something more sophisticated. I want an on/off switch, adjustable temp control and removable/reversible plates. Everyone I researched has several poor customer reviews and the complaints seem to be repeated by several reviewers. Of course, I am only paying attention to the bad reviews. I’m afraid the good reviews are placed there by the manufacturers. Any suggestions? It is very frustrating.” Marilyn B.
PG: “Marilyn, you’re experience is exactly why GreatStuffThatWorks.com was created. We know how hard it is for people to sort out what product is actually good in any product type and the Countertop Grill category has many options. 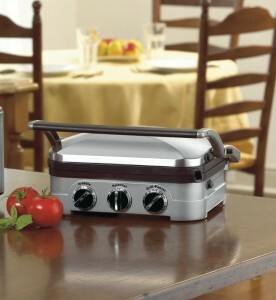 Our research found a Countertop Grill I believe meets all your requirements and will be easy to live with. Based upon on our experts feedback, consumer experience research and our own personal testing, you should have years of solid performance from the one model that qualified as a GreatStuffThatWorks Product. 7. Selectors: Choose the Grill/Panini or Griddle function. 12. 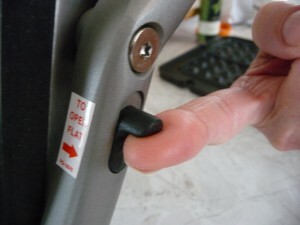 Plate Release Buttons: One top and one bottom. Push in to release and remove cooking plates. 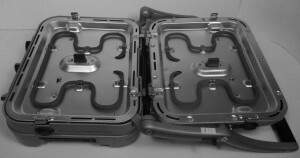 Each release button opens the two plate latches simultaneously. 14. 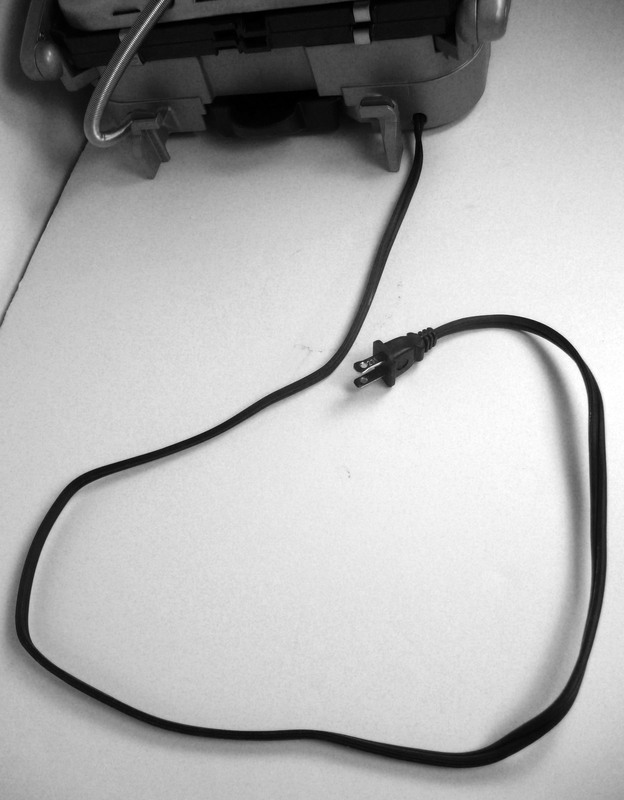 38″ Power Cord for easier outlet reach. 15.) Stainless Steel grill plate clips for improved durability. Many people are big fans of Countertop grilling for its fast, versatile cooking method and convenient size. 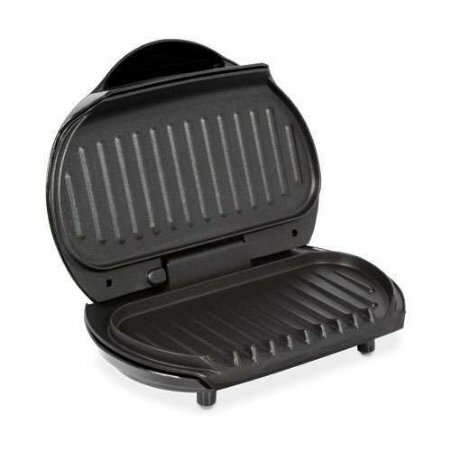 But, Countertop Grills are a product category that until you say the words “George Forman,” most are not sure what you’re talking about. Since the time “George” created the category, many companies have made their own version of this versatile kitchen appliance. 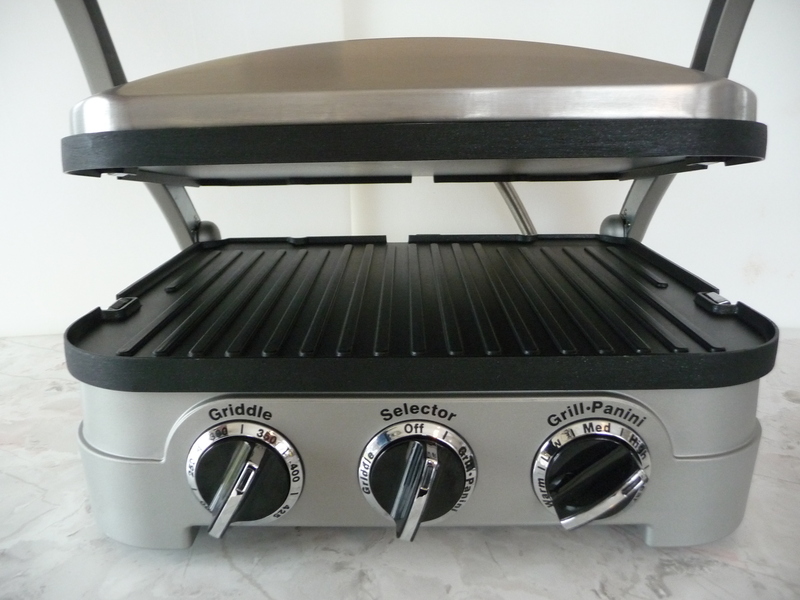 Originally released in 2012, the Cuisinart Griddler 4N model qualified as a GreatStuffThatWorks Product because this model has evolved to address nearly all the issues people have expressed about earlier Countertop Grills across multiple brands. It is well made, multi-functional, easy to use, has a customer support department that we found accessible and helpful and is backed by a three year warranty. Now, most importantly, here’s what this Countertop Grill can do for you……. 1.) 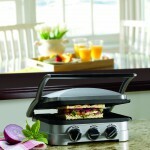 To conveniently grill meats and vegetables indoors in a way that drains fats and oils away from food as it cooks. 2.) 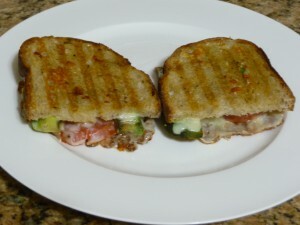 To enjoy Panini (grilled top and bottom) style sandwiches. But it can also cook a variety of other edibles quickly and quite well. We’ll explain as we go…. Like all products, if you read reviews in this category (and we often read hundreds when we research a product), you’ll find issues people have experienced across all brands. Some are the result of poor design, quality control, user error or trying to use the product in a way it was not designed. After talking with experts in a product type, we always start our second research phase by identifying the primary concerns users have had with that type of product. 1.) Grill plates were not removable, making clean up difficult and awkward. 2.) The top lid did not angle, creating a wedge effect when closing the top lid on a tall sandwich. 3.) 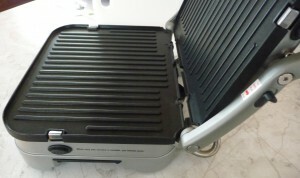 Attachment clips that hold removable grill plates were made of plastic and either broke or melted. 4.) 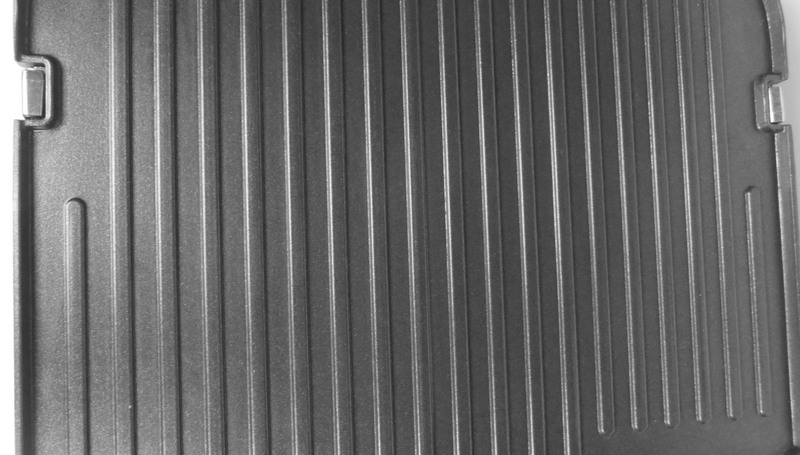 Non-stick coatings began to peal in a very short time. 5.) 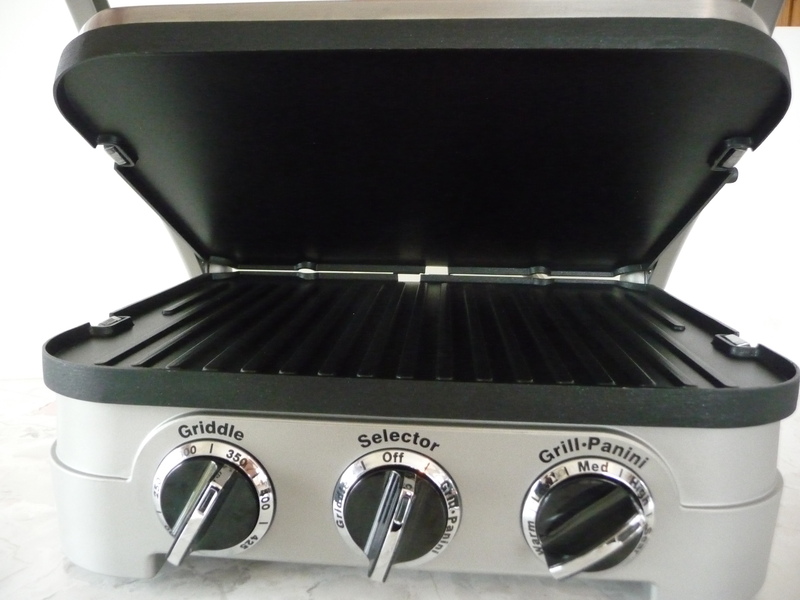 No variable temperature control for the top and bottom grills. 6.) No “Off” switch. The only way to turn off the grill was to unplug it from the wall. 7.) Grease would not drain properly and hot grease would warp the grease collection cup. 8.) Power cord was too short. Not enough cord to reach an outlet conveniently. 9.) Top griddle didn’t get as hot as the bottom one. 10.) 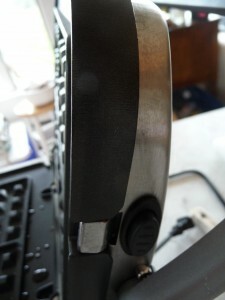 Tall, narrow grill ridge spacing on some brands made cleaning between ridges difficult. 11.) User Manual was poorly written and with no time / temperature recipes included. So Marilyn, I understand why your search has been frustrating. 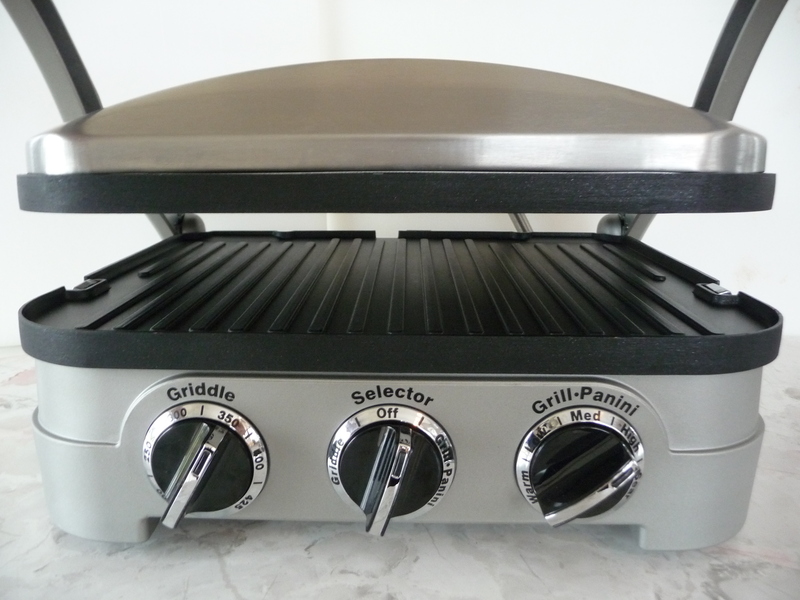 But our research and testing found a model that meets our GSTW standards as a well designed, well made Countertop Grill and it does everything you requested and more. 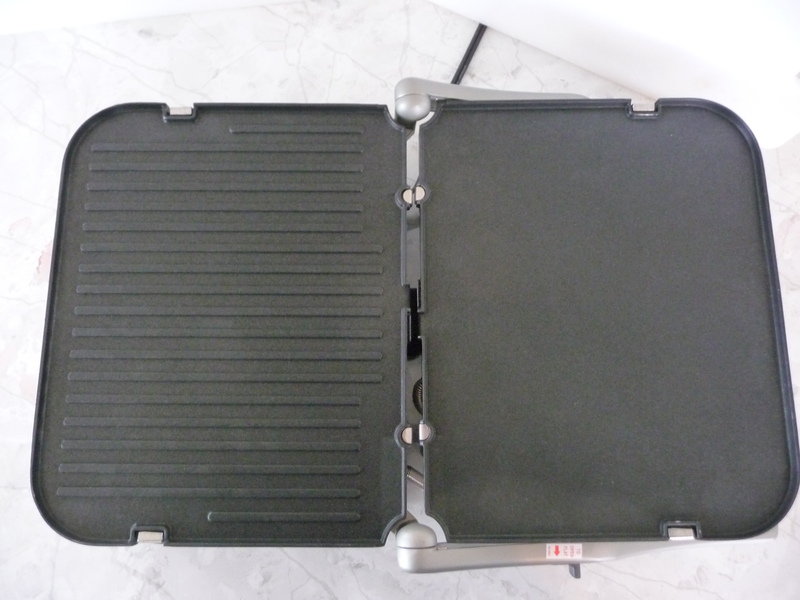 Here’s why the Cuisinart Griddler 4N qualified as a GreatStuffThatWorks Product! 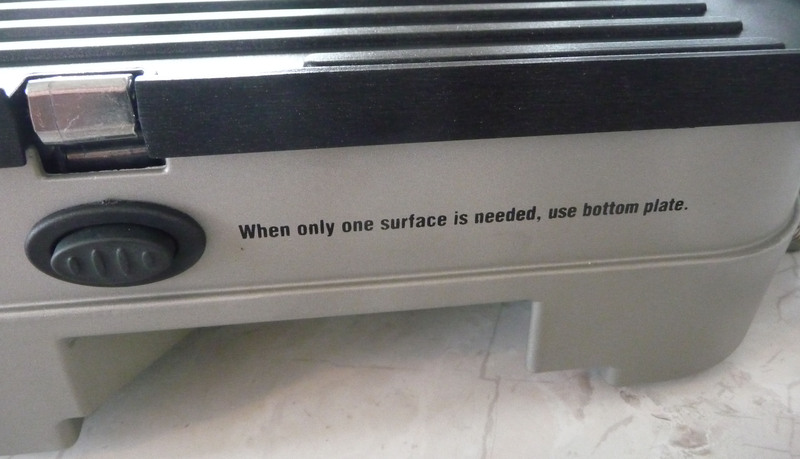 As you experienced, older versions of this product type had fixed grill plates that made their flexibility limited and clean up very awkward. 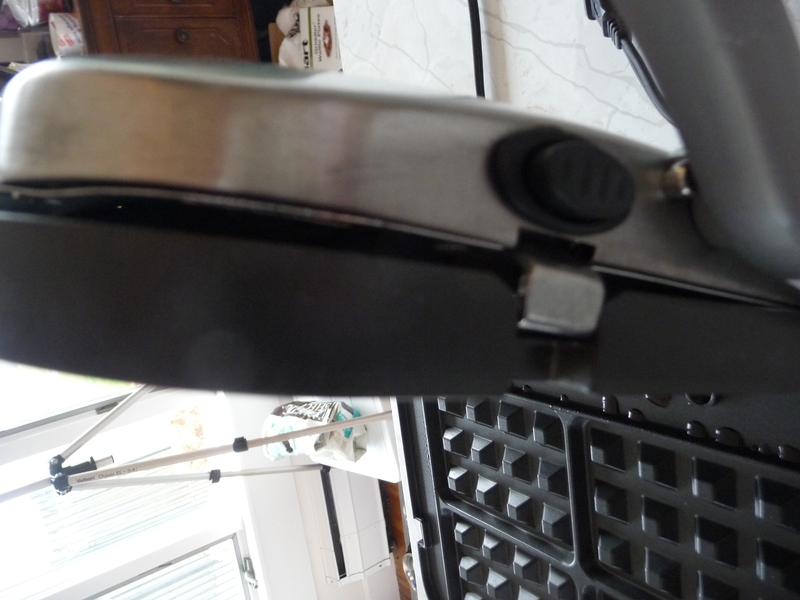 With the non-removable plates covered with grease, the only way to clean them was to bring the unit near the sink, carefully apply soap and water onto the griddles and then wipe them down with paper towels. Our users experience research, confirmed by our testing, showed this makes cooking different types of food (bacon vs eggs) efficient and the pop out, dishwasher safe plates, can go right to the sink or washer for easy clean up. 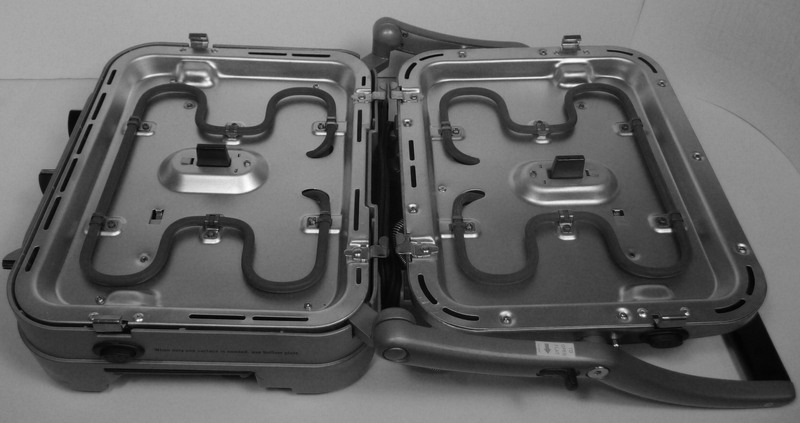 Tip: When you first open the Griddler 4N, we recommend fully washing the new plates before their first use. This helps remove any manufacturing residue and can reduce first use smoking from the new plates. 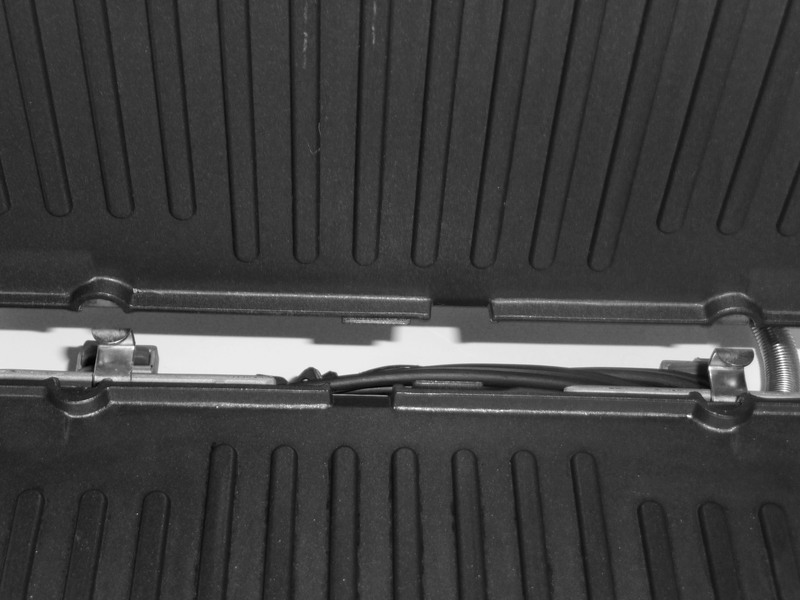 But what really adds to the Griddler 4N’s versatility, is a slider on the handle that transforms the Griddler 4N into it’s “Double Grill” position. Before you start, just slide the top handle release to open the grill so that both grills face the sky. 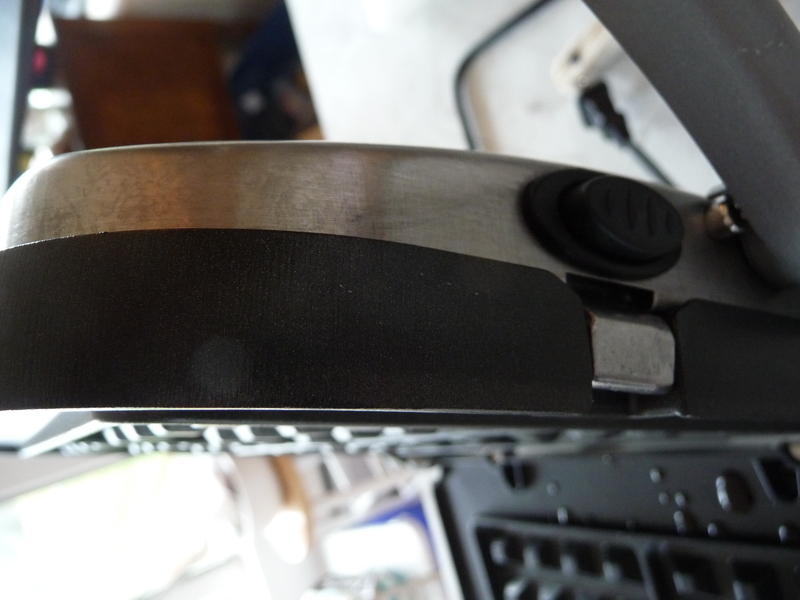 The front handle becomes the stand for the top. Then choose the plate surface you want for each half and set the curved plate notches into the stainless steel hooks at the back edge. 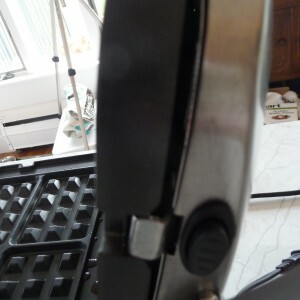 Snap the sides of each plate into the two stainless steel clips on each side, being sure they are fully latched. 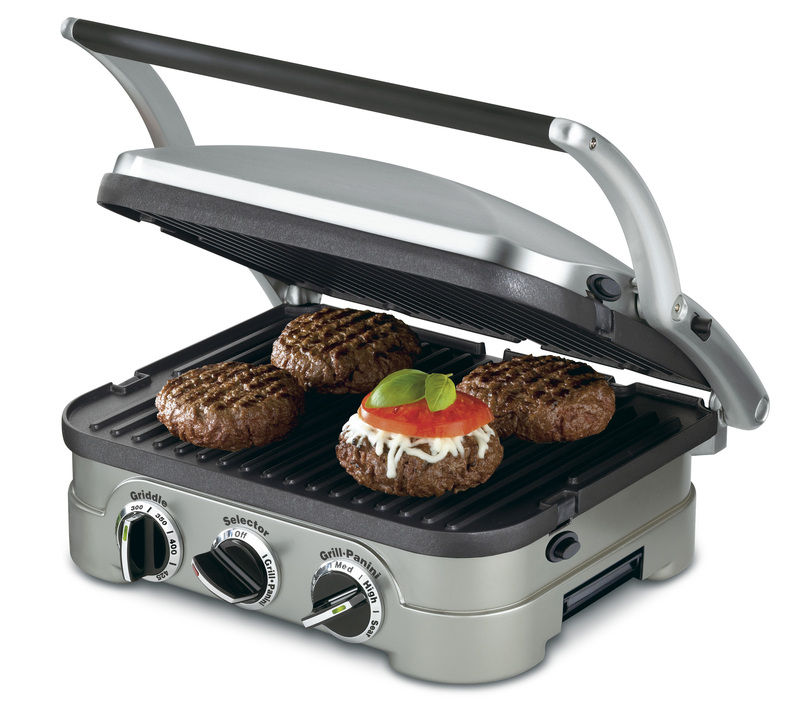 You then choose either “Griddle” or “Grill-Panini” on the center power Selector. 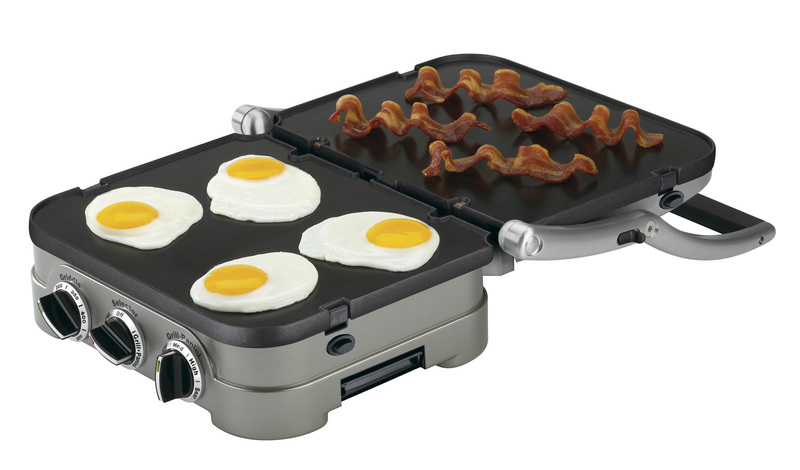 “Griddle” will activate both plates and let you set the temperature on both grills to specific temperatures from 200-425 degrees. In the open “Double Grill” position, both griddles can cook two different types of food simultaneously or twice as much of one. 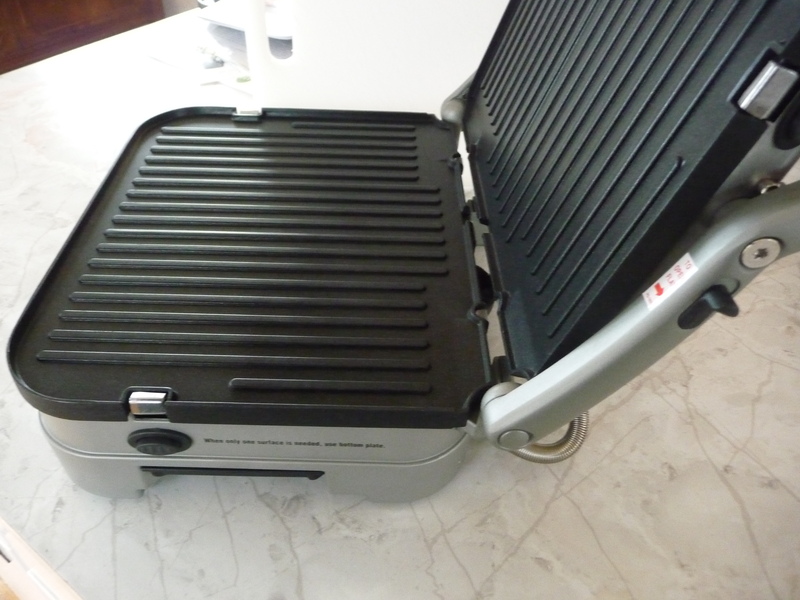 To re-latch the grill top, just remove the sandwich and close the top lid against the bottom plate. Holding those hot plates to the frame on many other units we looked at were “heat resistant” plastic clips. One of the recurring issues our research uncovered was that over time, some of them melted or distorted, making secure attachment or removal for washing the plates a problem. 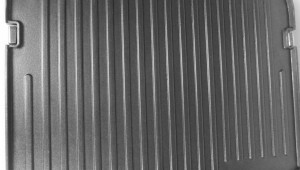 Retaining a non-stick coating on metal has always been a challenge for manufacturers. High temperatures, expanding contracting metals and users cutting or using metal kitchen tools on them has not made it easy. That said, some manufacturers have had greater success than others and the Griddler 4N appears to have one of the better lasting coatings. Our research found very few complaints about the coating releasing. (Issue #4) In some other brands we found complaints about the coatings in just a few months of use. or melted cheese overflow from Panini’s, and Sockeye Salmon rubbing juices, all cleaned up easily and quickly. By taking the fully cooled plates to the sink and washing them with soap, water and a paper towel, everything wiped off easily. If you are cooking different types of food in one session and want to remove the remains from the last item, Cuisinart recommends using a wooden spoon or heat-proof plastic utensils to push the excess food and grease buildup into the grease drain channels. 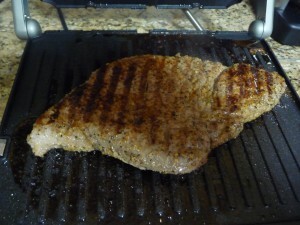 Then wipe the grill plates with a paper towel. The supplied cleaning tool should not be used while the plates are hot. TIP: To help preserve the non-stick surface, Always wait for the plates to fully cool before cleaning. The plates are also dishwasher safe, but our research found most people felt dishwashers did not remove grease well enough or left water spots. Many users confirmed the best way to clean them was by hand. We also found hand washing quite easy. Some of the grills in this category do not allow you to vary the temperature of the grill plates. Most all of the original versions of this product type were just “On” when you plugged them in and “Off” when you unplugged them. You played “how hot is it really?” and made your own notes for different foods. To make it more fun, cooking times were often not listed in the manuals. You’d think that a simple thing like an On / Off switch would be a standard feature, but in this product category it is not. Most all of these units turn on and off by plugging or unplugging the unit from the wall, not by a switch. Even the most famous of brands still requires unplugging, even when the up-line model’s cooking timer has elapsed. The timer is just a reminder to remove the food. 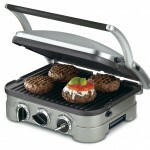 But the Cuisinart Griddler 4N has a large On / Off dial front and center and it illuminates when the unit is on. (one of the features you also wanted, Marilyn). (Issue #6) So when you finish cooking, you just switch it to “Off”, instead of stressing the cord yanking it out of the wall each time to shut it off. 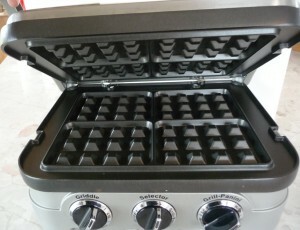 With the lid closed, the Griddler 4N comes up to temperature from cold in under 5 minutes, indicated by the green light on the setting dial selected. For waffles, Cuisinart recommmends using the “Griddle” selection and then setting the temperature to your recipe. 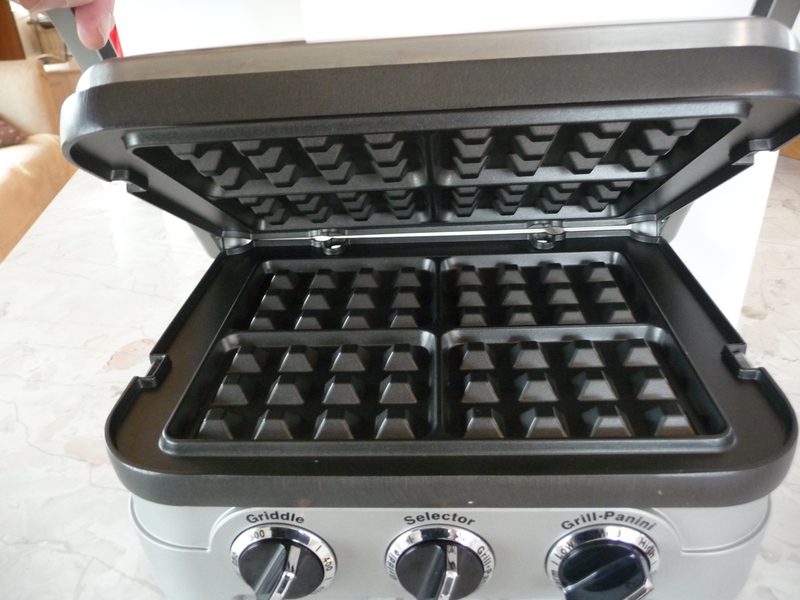 The Cuisinart “Basic” waffle recipe suggests 400 degrees. 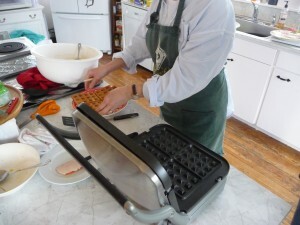 My guest “Chef” (a wonderful cook and great friend’s wife) volunteered to make waffles for 6 of us one Sunday morning. I clipped in the optional waffle plates and turned it over to her for the test. 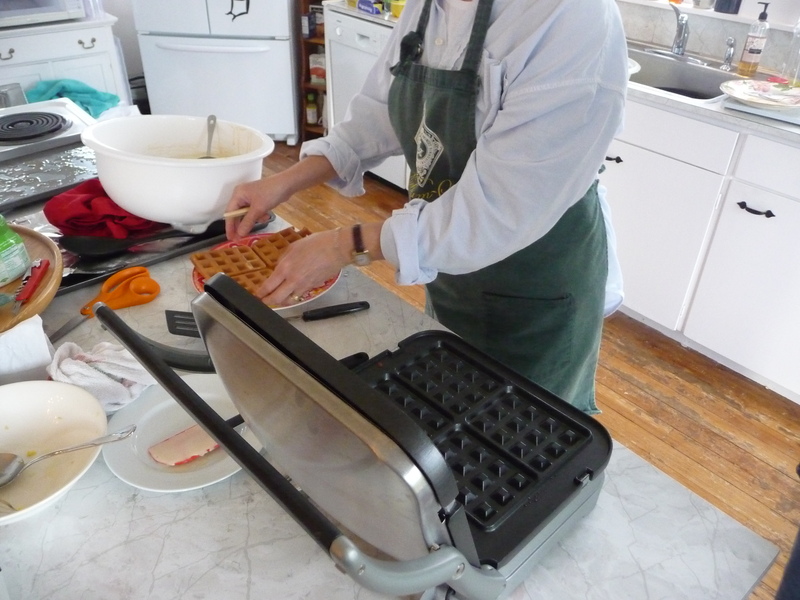 She followed the Cuisinart waffle recipe in the provided recipe book (reverse side of the waffle plates manual). These Cuisinart tested recipes list both the ingredients, the temperature setting, plus the expected time to cook. When you’re installing the plates, particularly the top one, you need to be careful to properly hook the bottom of the plate into both of its lower mounts and then fully snap the upper clips around the plate sides. 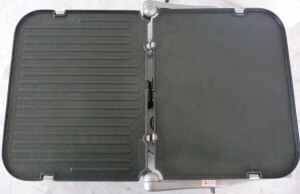 If the plates are not properly seated, the grill plate will not be evenly spaced to the heating element behind it. This crooked installation DOES result in uneven cooking. In our first tests, I quickly installed the plates and didn’t confirm I had fully snapped the upper plate in on both sides. 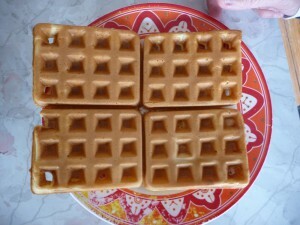 Result: Our guest “Chef” for our waffle plates test discovered the first waffle out was lighter on top than the bottom. Per the Cuisinart directions, we lightly sprayed each plate with non-stick cooking spray (we had Pam) before each batter pour to assure easy removal and they came out very easily. The recommended 3 mins. 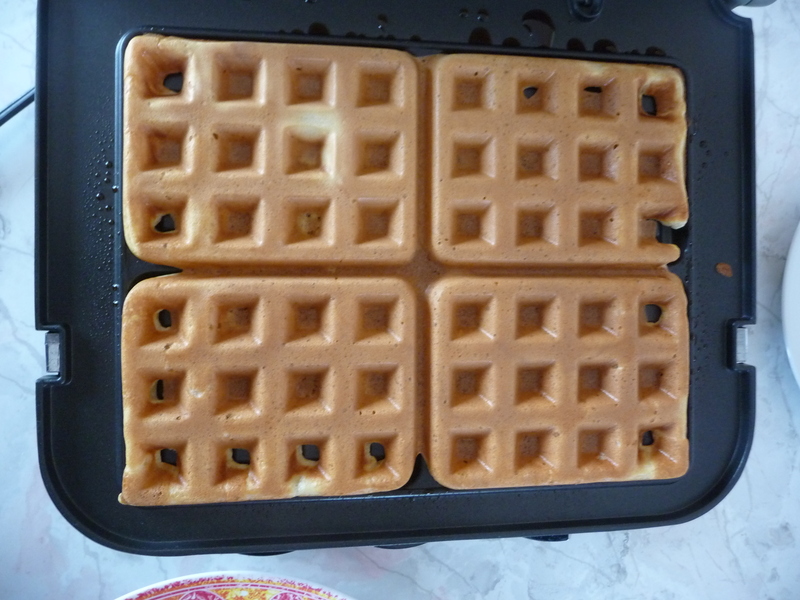 cooking time produced light colored, fluffy waffles. (and the consensus of the group, very good tasting). As with every cooking appliance, you experiment to find the “goldie locks” of time and taste for each recipe. 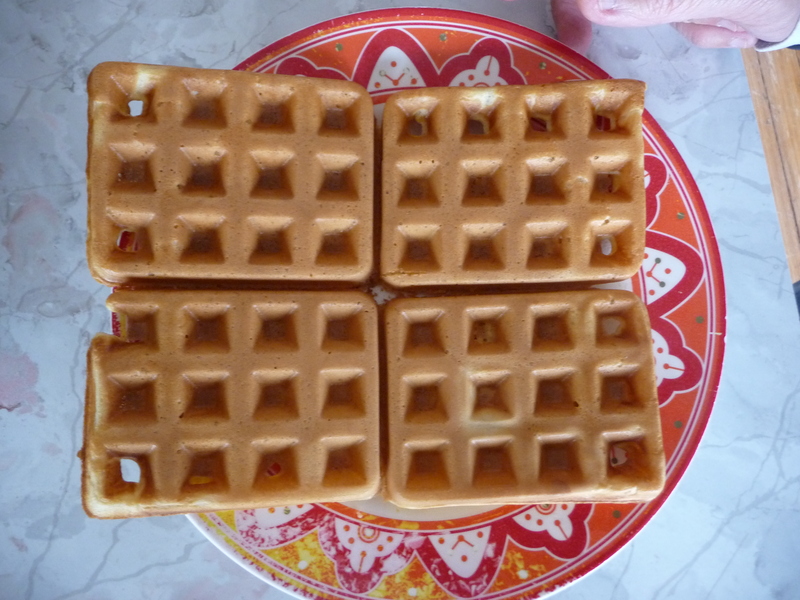 Our optimum time appeared to be 3.5 minutes per 4 section waffle consistently using this recipe. Dividing each one into it’s four sections to serve 6 people faster, “MS” just kept them coming until the batter was gone. The group consensus was the waffles were very good tasting and light. 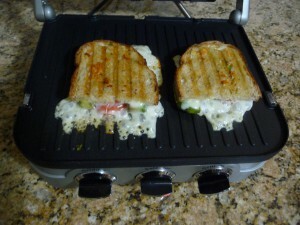 When you open the grill to put in the next item, while the top lid is released in the “Panini” position, we did have steam and oil droplets from the top drip onto the counter from the top lid. 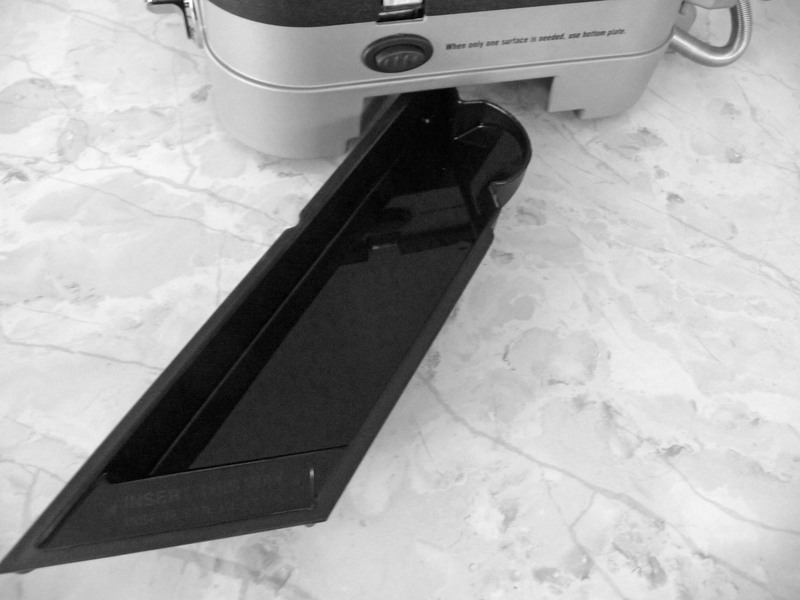 This happens because as you lift the handle to open the lid, the now horizontal lid moves backwards beyond the lower plate beneath. 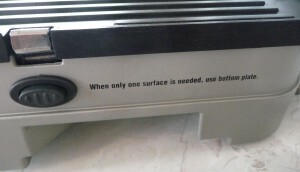 This causes the top plate’s back edge to hang over the counter where it can potentially drip. The dripping, when it happened, was minor, but we kept a paper towel handy to wipe the counter when we noticed something had dripped off the top plate. Something I did have to get used to is how fast this grill cooks. A steak that I would normally cook two to three minutes per side, you guessed it, was done in half the time, as both top and bottom plates are cooking simultaneously. So, as you’re getting used to this new appliance, err towards checking doneness sooner rather than later. The final issue on our list was the length of the cord (Issue#8). Although the amount of smoke generated in our tests of fish, meat, Panini’s and waffles was surprisingly small (it never set off our smoke detector 6 ft. away), some users with stove hoods wanted to set up their countertop grill on their flat stove top to take advantage of the venting. Some other popular brands only had about a 2 ft cord, making reaching the outlet near the stove not possible without an extension (See page 2, Cuisinart Manual for guidelines). 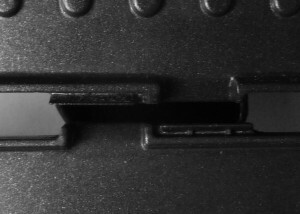 The cord also stores conveniently, wrapped around the support legs at the back of the unit. 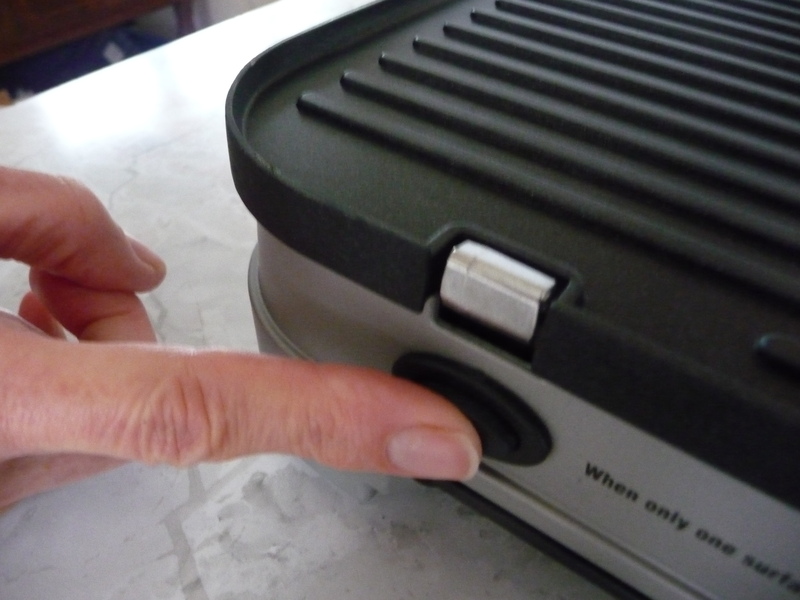 Finally, one feature we thought might be a nice addition to the Griddler would be an on-board timer. 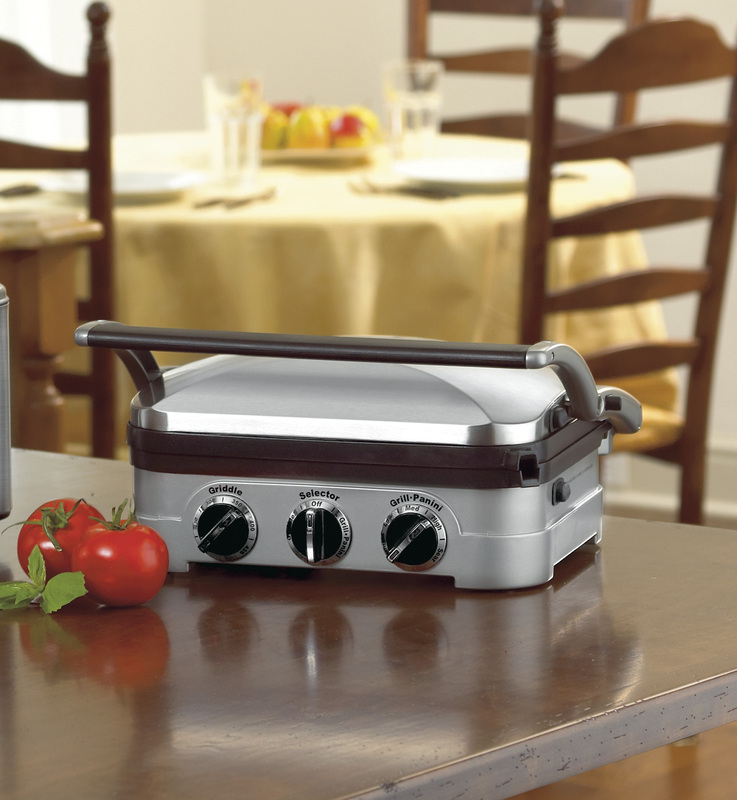 Cook a wide variety of grilled foods indoors with great convenience and speed. Qualified as a GreatStuffThatWorks Product! Important Note: The Waffle Plates are an accessory item and are ordered separately. All this talk of food has made me hungry.